I know it’s a football reference, and I haven’t watched a football match for many years, but the GB relay team has the same air of inevitability about it that an England Penalty shoot-out had. You just knew. It didn’t matter what your hopes were. You just knew. As those who’ve read my other posts on SpeedEndurance will know, my favourite track event is 400m. I won’t go into why here. (For reference, my favourite field events are Pole Vault followed closely by Hammer). My second favourite event overall, though, and the one I love to watch is the relays. 4x400m and 4x100m. I love both and so I’m both disappointed and embarrassed on a regular basis by the GB team. So, who’s to blame? Well first, I don’t blame the athletes. It’s possible that CJ Ujah went off too early, but that doesn’t make it his fault. Additionally, I don’t blame the coach. They should take a share of the responsibility, of course, but not the blame. So it must be the governing body, British Athletics then, right? Well actually, I think it goes deeper than that, but I think the governing bodies (there’s more than one in GB of course), must take the lion’s share. Here’s why I think that. To start with the obvious, we aren’t Jamaica, and we aren’t the US, so unless they screw up, we are fighting for bronze. So our best bet is to get the baton though the transitions faster than anyone else. That’s pretty much what China achieved. I don’t know how they did it, maybe luck, but I doubt it, but I know how we should do it. Earlier this year, we didn’t have a relay, coach. Having only a few months to prepare a team isn’t going to help us. We also don’t practice enough IN COMPETITION! Glenn Hoddle (sorry, back to a football reference) once said the team never practised penalty shoot-outs. The press vilified him, as they are wont to do. But I agreed with him. You can’t practice the pressure of that situation. Now, obviously you have to practice, but you also have to practice in competition. We need to be running relay competitions more regularly using the same squad, in different scenarios. Each member of the squad ought to be able to run two different legs. They should have often competed over a year or so in preparation for a major championships. They should have practised together often. They should know, not only where the mark is, but also know exactly when the call will come, exactly when the baton should be in their hand. If the call comes late, or the baton isn’t there, they will know to adjust. Unfortunately, they have often never even received from that incoming runner before, except maybe a few times in practice. It isn’t enough. 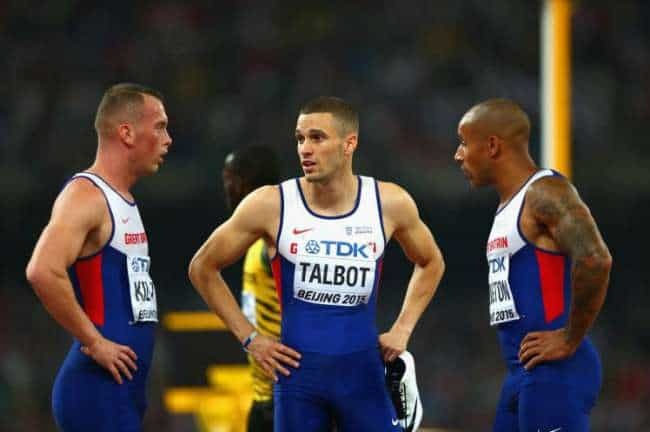 Plus, I’m sorry, but I understand if you have Usain Bolt or Justin Gatlin in your team, you might want to rest them in the 4x100m heat, especially if they’ve also run the rounds of the 200m, but we have no excuse for that. None. You run the heats with the same team as the final. Ideally you run for a year with the same team or at least the same squad. Injuries might force changes, but other than that, keep the team the same. Lastly, it comes down to the British competition system. We just don’t do relays. Hardly ever. Kids rarely get the opportunity to run relays. It isn’t a big thing like it is in the US and Jamaica. We need to change, right from the grass roots. We’ve only recently introduced a relay national championships, tacked on the end of another competition. English Schools, the biggest competition in England, doesn’t have a 4x400m. Time to change and take it more seriously. Let’s be honest, we have a better chance of a medal at relays than in the individual events to it might be time to give them a higher priority.